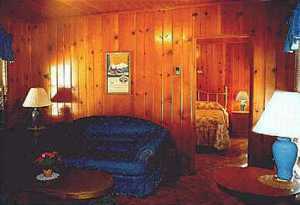 Located at the foot of Castle Crags just 50 miles north of Redding on Interstate-5 in Dunsmuir. Eat on the train -- sleep in a caboose! Since 1968, guests at the Railroad Park Resort have been reliving the romantic days of railroading. 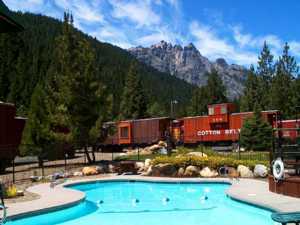 Built in a loose circle surrounding a swimming pool, deck and spa, the Caboose Motel is steeped in railroad lore. Once proudly coupled behind the freight trains of such legendary carriers as the Southern Pacific, Santa Fe and Great Northern, these cabooses now afford guests the opportunity to sample the life of a railroader without sacrificing the comforts of today. The resort features cabins, a dinner house & lounge and a 60-unit RV park complete with laundry and hot showers, game room and cable TV. The Featherbed Railroad B&B is located right on the shore of Clear Lake in Lake County in Northern California. At the Featherbed Railroad Resort, you get to stay in one of nine luxuriously redecorated railroad caboose suites set in a park-like setting overlooking a private dock, boat launch and beach. Most have in-room Jacuzzi tubs for two and all feature luxurious featherbeds. The cabooses are nestled among giant native trees in a park-like setting right on the shore of Clearlake, just two hours north of San Francisco and about 90 minutes away from Sacramento. There is also a 100-year-old historic Main Station house featuring the Grand Dining Room which you can access during the day. Mendocino, Healdsburg and Calistoga are nearby.